In October, Jonathan and i did what we love to do most of all: took off for a new place to meet each other all over again. My brother Thom was studying in Prague for the semester and it was the perfect opportunity both to visit him and to explore a new crook of the world. If you read my interview over on Viscera Stories, you’ll know that one of my favorite parts of travel is finding that the mundane is made new all over again. It’s also in that newness that i find myself meeting people i’ve known for years for the first time again. 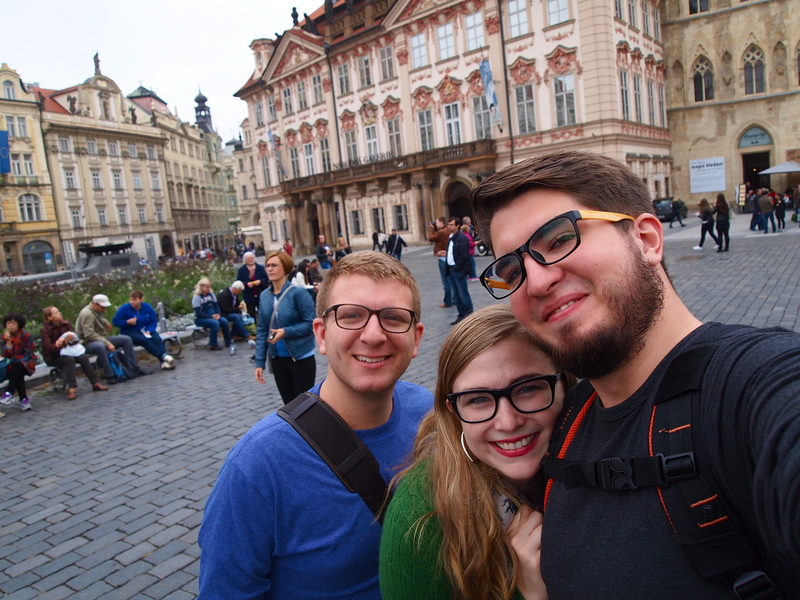 Seeing Thom, my younger-but-taller brother, expertly navigate a city in an entirely new language to him (Czech) and participating in his life as an adult was a real treasure. Jonathan and i had some days to wander about by ourselves while Thom had class. We tried to find a monastery, and wound up in a nunnery, which felt prophetic. Loreta, built like the one in Italy of the same name, to honor the alleged brithplace of Mary. [Don’t question the Italian distance from Nazareth]. We had the cloister to ourselves, and every chapel was dedicated to Mary or another woman saint. I wept. We finished the afternoon with the above view and a cup of tea and a long chat with our waitress where we taught her North Carolina English slang and she gently corrected our frenetic Czech attempts at ordering the cheese plate. Prague was also clearly a city reeling from communism; Thom was strict that we were not to speak on the trams, to stay quiet in restaurants. There was a joviality between friends, but not an openness to strangers. Religious iconography adorned almost every building, but then there were layers of grimey graffiti around the edges. You cannot go to Prague and not at least walk to the Jewish Quarter – a once thriving part of the city, now full with ten times more more tourists and tombstones than Jewish inhabitants. Remnants of a not-so-long-ago genocide. There are numerous famous sites to visit, but we decided our hearts could best handle a long time in one place, and i was most intrigued by the Spanish Synagogue. All the architecture and design is done in a style similar to Islamic art in Spain and Northern Africa – interlocking patterns, calligraphic Hebrew verses, and no images of people or prophets. All the descriptions were in Czech, but the piles of tefillin stripped from faces and mezuzah ripped from doors all now piled behind glass cases told the story well enough. 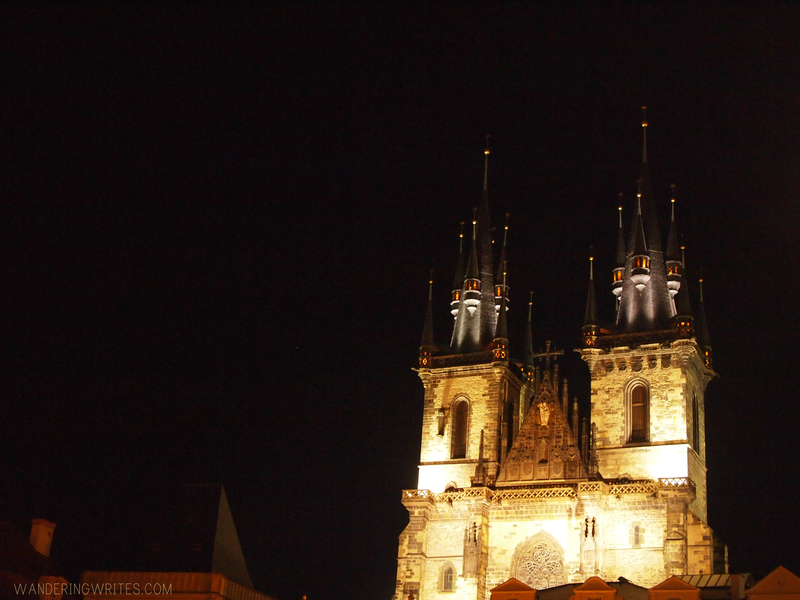 Prague is often described as the new European hotspot; it’s extremely affordable (seriously, the amount of beer consumed for the pittance of pennies spent) and rich in a complicated history. On the one hand, there’s all the color and warmth of Central Europe and the Mediterranean, but on the other, there is the brooding undercurrent of Easter Europe’s communist history. 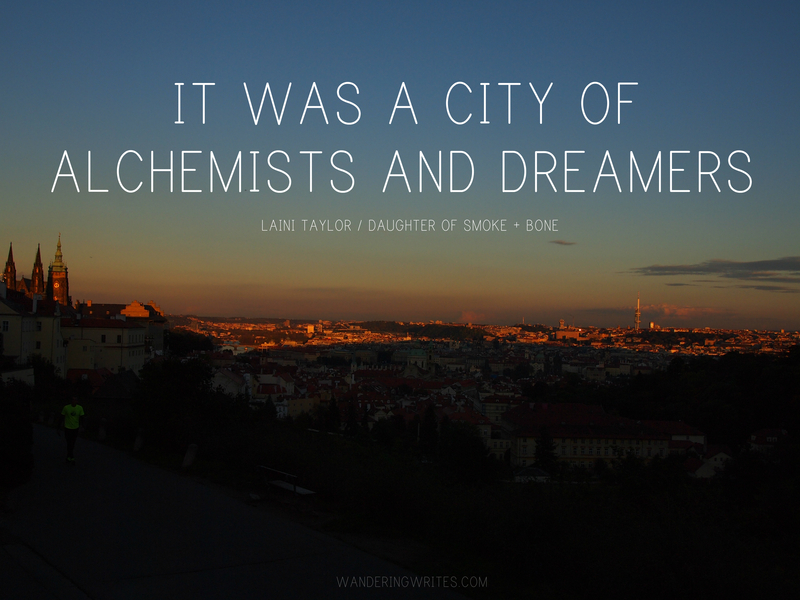 It is a city coming to know itself all over again. Which is the epitome of traveling together, for me. My husband, my brother and i met between buildings of saints and sinners, over goulash and pizza, we met again for the first time and talked as old friends. Have a beer in a local micro-brewery. Slash, have a beer with every meal. It’s cheaper than water. Try goulash or, if you’re brave, point randomly at the Czech menu and smile. This game of mine has not always paid off (anchovies over cooked carrots in Spain – blech!) but in Prague i wound up with a potato-onion pancake with brie melted inside. Aaah-mazing. Visit Loreto, the nunnery on a hill overlooking the city. Quiet, less touristy than the main squares, and very affordable. You do have to pay for a photography pass. Pay for the pass to see the inside of the Saint Vitus Cathedral at the Castle. The stained glass is breathtaking. Meander in the Jewish Quarter, but try to go when the crowds are lighter (early in the morning) to give the place the time it deserves. Don’t plan on doing anything fun after. Walk across the Charles Bridge at sunset, when the vendors are closing up shop and the tourists dispersed. You’ll have time to look at the statues then, and the Vlatava river sparkles as the city lights splutter on. Avoid: Wenceslas Square, if you can, unless it’s a date memorializing the Velvet Revolution. Otherwise, it’s an overpriced and overcrowded Times-Square-esque thoroughfare. Also, beware pickpockets and try not to talk on the trams. Highly Recommend Miss Sophie’s Hostel for cleanliness, location, and unbelievably kind staff.